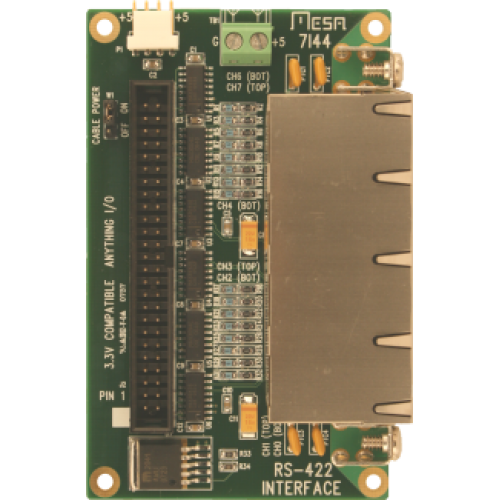 The 7I44 is a 8 channel RS-422 interface for Mesa's Anything I/O series of FPGA interface cards. The 7I44 has 8 independent receive and transmit channels. Each transmit channel has a independent drive enable for bus or 2 wire half duplex systems. Serial I/O connectors are RJ45 jacks allowing standard CAT5 cables to be used for high speed serial links. 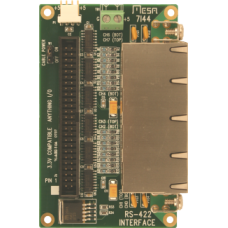 The 7I44 also supplies 5V power on the RJ 45 connectors. PTC devices limit maximum 5V current to 1A. The pinout used is compatible with Mesa's 3C20 motion controller and the 8I20, 8I21 serially connected amplifiers and all serially interfaced I/O cards.